Another rainy day here, and the girls were starting to go through a bit of “messy art withdrawl”. We made flower prints using empty soda bottles! In our case, they were empty seltzer water bottles, but you get the idea. Clara really got into the painting today! She could hardly contain her excitement! 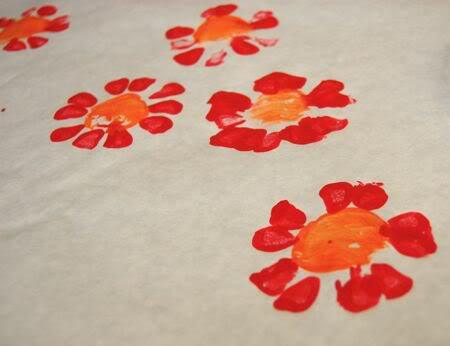 To make your own flower prints, roll out some freezer paper. 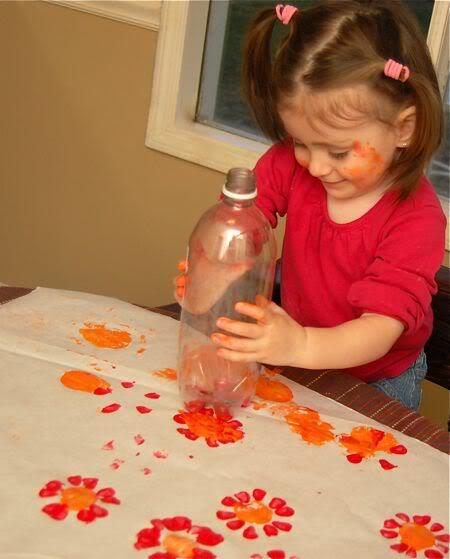 Dip the bottom of an empty soda bottle into some paint, then stamp on the paper. Rotate the bottle around to make even more petals! 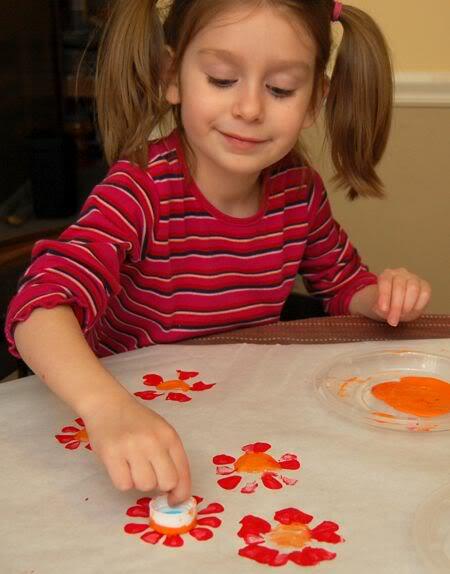 Dip the bottle cap into some paint and it makes a great stamp for the centers of the flowers! The girls took turns stamping with the cap and the bottle. So much fun! They look so bright and cheerful! Bonus points for drinking imaginary water from your empty bottle! EXTRA bonus points if your face is smeared in paint! Now see I've made flower cutouts from the bottoms of soda/water bottles but it never occured to me to use the bottle as a stamp! I gotta go rummage through the recycling now . . .
Now that is how a great Mom solves the problem of a rainy day and two active girls! knowing my girls…we'd jhave lots of bonus points! @ Readily A Parent — You were making too much work for yourself! 😉 Have fun! @ Lenetta — Hahaha! Thanks so much for the link! I really appreciate it!! Look at those big brown eyes! Fun and easy craft idea. What a great idea! We'll have to do this soon. I just need some soda bottles! Where do you get your inspiration for these fabulous ideas? 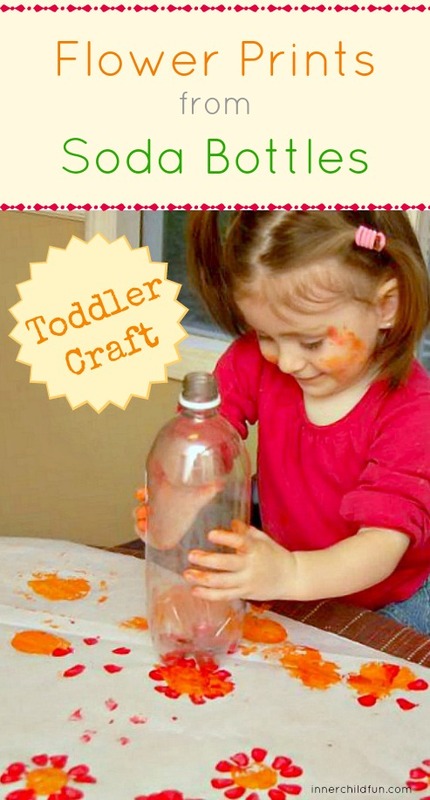 You have such creative (never mind low cost) activities that are simply brilliant! Great idea and I love the pics of the kids! My girls would love this. Super cute idea! 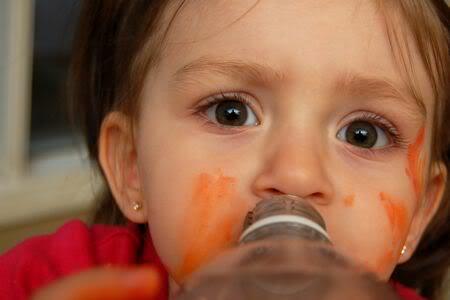 We never have bottles like that; I'll have to get some from the grandparents. I love the paint all over Clara's face! I've been meaning to do this for forever – thanks for the reminder! Oh my goodness- i am just going to eat Clara up! Could she get any cuter?! Oh, and the flowers are cute too 😉 haha! Love love love this idea! We are putting this on the to-do list! Lu will have fun with it! 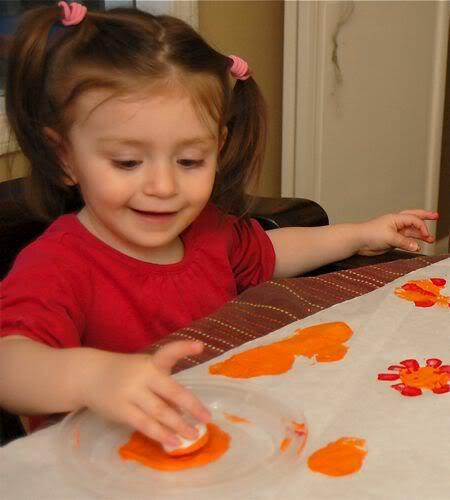 She loves to paint! I'm new to your blog. I just LOVE IT. So creative and so frugal. Thanks for all of the great ideas. @ Rebecca — Hahaha! You crack me up! @ Sherry — I bet Lu would do a great job with this! Can't wait to see!! My kids would love this. I'm thinking I might try setting them up with different things to try stamping with……. That could be really fun. And I love the paint smudged faces, those are the best pictures. I had a dress with that very print by in High School!!! @ Suzi — That's amazing! I didn't think to stamp it on fabric, but that would make a lovely design. I'm going to have to give it a go! Such a great project Valerie! I love the colors the kids used too! I am SO doing this with my kiddos! So cute, I had no idea! We typically don't have soda in the house. That bottle was from some seltzer water. The real seltzer water — just carbonated water, not sweetened. Awesome, easy idea! 🙂 Thanks! This is so creative! I love it. Another great use for bottles and bottle caps! Great idea to use the bottom of a 2 litre bottle to make flowers. It looks like it is a lot of fun to make too. That is so creative Valerie! Not to mention fun. Thanks so much for the great idea, I'll be linking. I thought of this post today when we were getting ready to create wrapping paper. We gave it a try, and Ava loved it. We used a 20 oz. bottle, as well, since I happened to have one sitting around. Credit to you on my post. Gave this a shot & my daughter did her own interpretation. What a fun idea.